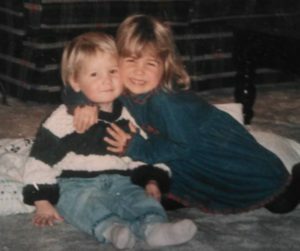 Two of my kiddos, Hayden and Kayla, when they were little. Even at this ripe age, they were earning a couple bucks here and there for easy chores and were required to save 25% of everything they earned. Sometimes this meant putting just a single quarter away in their piggy banks. Does advice get any better and simpler than that? Most of us know someone who didn’t necessarily make a lot of money but they always seemed to have a lot of it because they were diligent about saving, come rain or shine. We also all know that person who makes a lot of money but is always broke. These are choices we all make and habits we start building as kids. My four kids all handle money very differently. Two of them are super disciplined and save money like it is going out of style. One of them saves money here and there, whenever it’s convenient, with no real plan in mind, and one of them was born with a hole in his pocket. They have all grown up in the same household with the same values and lessons about money from Tanja and me, yet they each have vastly different mindsets about saving. We owe it to our kids, grandkids, and great grandkids to teach them the the importance of spending their money in a healthy way because financial discipline and good habits pay off in spades in the future. I’ve written before about the power of compounding. Showing and teaching young people about compounding can literally change their life. When I learned about it in my late teens, it almost became an obsession and somewhat of a game to see how much money I could save just so I could watch it compound. It helped me see that little bits saved and compounded could turn into millions of dollars. It’s an easy concept but if one has never been exposed to it, they may lack that motivational boost to make it happen. I wanted to find a way to help with this. At Hughes Private Capital, we allow our Guardian investors to add a kid’s sub-account to their account. The youth can receive their own monthly Capital Statement and watch their money grow. You can set them up with your money, their own savings, or a combination of both — but ideally it should include some of their own money so they can get the satisfaction and reward of earning and saving on their own. The more we learn, the more our approach to finance changes over time. In my early 20s, I was all about the stock market. I studied books and started an investment club with my friends. We knew we were going to outsmart all the others with our stock picks! I always believed if you worked at it and studied, there was some way to make a killing in the stock market. My thought process on that changed about 15 years ago. That’s not to say you can’t make money in the stock market, but when 97 percent of index funds outperform actively-managed funds in the same sector, it tells me that it is very difficult — if not impossible — for the average investor to reliably outperform the general direction the market decides to go. When the market goes up or down, so do your investments. This is where we get back to compounding. It is not so much about outsmarting the market or making the perfect stock picks; it is about saving your money, living below your means, investing in the best investment vehicles you can find, and letting your savings compound over time. In the long run, the act of saving is more important than making perfect investments. If you don’t grasp the concept of compounding at a young age, it is hard to understand how that little bit you put away turns into much bigger dollars in the future. My main investment all my life has always been the businesses I have owned, especially toward the beginning of my career. I found I had almost no choice but to put most of my dollars back into my business so I could build it and continue to grow. I am no longer interested in the stock market. It includes way too many unknowns for me. Today, I have an advantage, since Hughes Private Capital manages investments and I get to see firsthand how they perform. That insight makes me comfortable and I have put most of my investment monies there. I want to be clear: that doesn’t make the stock market a bad investment… it’s just not for me. For some people, the stock market is all they know and they have never bothered to learn more or expand beyond it. But, I imagine that if you are reading this article, you are very aware of other investments and are most likely investing far beyond the stock market. Don’t we owe this knowledge to our kids, to pass on what we’ve learned throughout our lifetime and help them make even better decisions than we did? At the very least, let’s get them in the habit of saving a portion of what they make. If you have interest in setting up a youth account, contact us and we will make it happen! Call or email Stacy Silva: Stacy@HughesCapital.com, 775-636-8394.